Infrastructure Security Blog: A Humorous View of our Infrastructure Crisis -- I think! A Humorous View of our Infrastructure Crisis -- I think! For those of you who have followed this Blog these past few years you'll know that I'm very passionate about the state of the country's -- let alone world's -- infrastructure. In particular the US infrastructure grade from the American Society of Civil Engineers remains around a D+.....a failing grade for most schools! 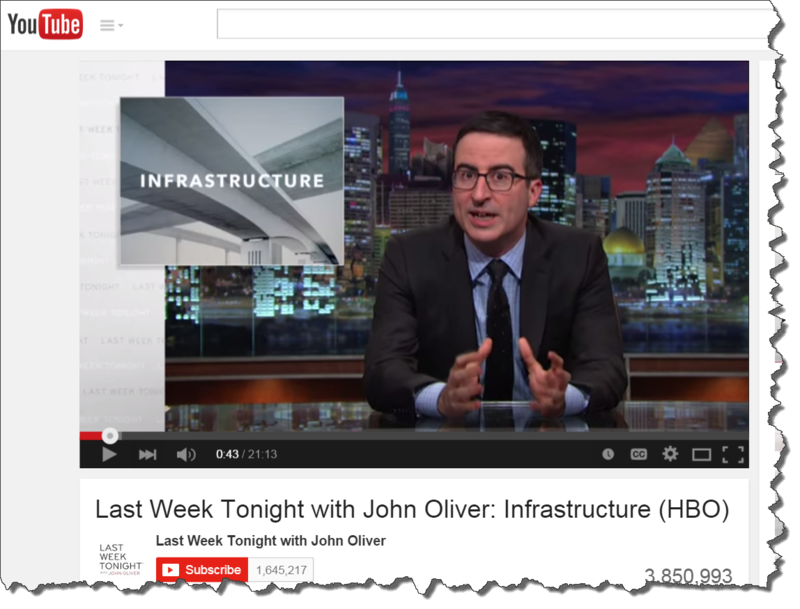 Well, yes, this is a crisis; however, John Oliver of Last Week Tonight on HBO recently offered a thought-provoking and (sadly) quite humorous review of the state of the US infrastructure and how even our politicians are simply not paying attention. Please enjoy...then write a letter to your Congressman/woman and demand some attention (and funding) to repair and sustain our infrastructure.